With today’s game a sellout, it was good to see our worldwide fan base coming together. Although I missed our Hong Kong Whites who were outside the Peacock when my daughter Dani arrived, it was good to know that plenty of our Scandinavian fans and Irish fans would be here today. As my granddaughter Laura and I headed to the Peacock where I was hoping to meet up with some of the Not606 Forum members, I remembered that I had to buy a programme today. On the Supporter’s Club page were two photos of my granddaughter Hannah and I from our recent visit to Berlin, one taken in Stockport International airport and the other by the Brandenburg Gate with us both wearing our Leeds shirts with pride. After the recent atrocious weather, it was nice to stand in the garden and chat to plenty of Leeds fans. Speaking to one of our lads later who is at the front of the Kop, he said he was soaked to the skin after the Preston game midweek. Unfortunately due to his wheelchair, he had to stay put and was the only one in his group who got saturated sadly. I found the people that I needed to and it was good to meet up and chat, before both of my sisters Karin and Erica arrived with a friend. It’s not often we get a photo of all three of us at Elland Road at the same time, but thank you Laura for doing that for me. When Chris Turton came to say hello and he said the last time he’d seen me, there was no thought of me having children or grandchildren so that shows how long ago it was. It was good to meet him and his family. I know I shouldn’t get superstitious, but I tried to banish the thought of Birmingham not having won so far this season. I wish those stats were never mentioned because it always turns out wrong for us. In discussions before the game I said I wouldn’t get carried away as there is a long way to go as yet and would rather just keep getting the points and see what happens later in the season. With Monk coming back as their manager too, I didn’t want him to have the satisfaction of becoming the first team to beat us this season in the Championship, but sadly that became the case. It felt as if his ghost at Elland Road had a detrimental effect on our team’s game today. The team: Peacock-Farrell, Ayling, Cooper, Jansson, Harrison, Douglas, Phillips, Roberts, Saiz, Alioski and Klich (an unchanged team). Subs were: Dallas for Phillips (34), Forshaw for Klich (62) and Edmondson for Douglas (71). 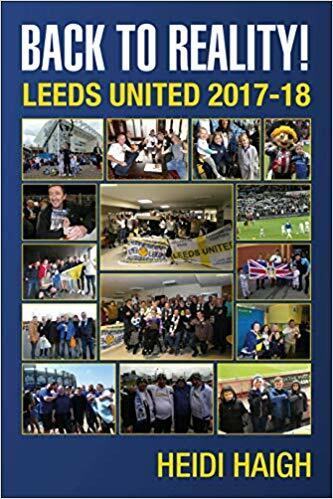 Leeds lost the game 2-1 with Alioski getting the Leeds goal (85). Attendance was 34,800 with 1,314 Birmingham fans. Eight minutes of injury time was added on at the end of the second half, the majority for time wasting. Before I go on, the ref today was an absolute disgrace to the profession. Conned time after time with play acting and time wasting, why did he wait until eight minutes from the end to book one of their players for the latter? You could see him getting a flea in his ear after stopping the game again in the second half. He could have put a stop to it in the first half instead of letting Birmingham dictate the game that way. As someone said after the game, they reckoned he wasn’t fit enough to keep up with play and kept wanting a rest. That wouldn’t have been so bad if he hadn’t ignored the amount of fouls on Saiz and booked him when he complained about the time wasting. It is time that the EFL stood up to be counted with the amount of referees we have already had this season who should be demoted, as they are not good enough! That said, we lost the game within the first 20 minutes as we failed to play to our strengths and let in two soft goals. It was one of those moments when you felt that playing three games within the last week had taken its toll on us. Our passing wasn’t crisp enough and we were letting Birmingham get the better of us and didn’t close them down enough. When their attack ended with Peacock-Farrell committed to the wrong side of the goal as the ball was struck into the right hand side from where I was looking from the Kop, I was sure no one deflected it. I think that was the case as he was anticipating where the ball was going rather than waiting to make the save. It was a soft goal to give away though. From there things didn’t really improve for us either as we seemed to be playing more to the benefit of Birmingham rather than our strengths. Pumping balls into the air when they had massive players, who were able to bully us, seemed counterproductive. We were too slow to the ball quite a few times too. It was no surprise when they got a second goal as we had struggled to make an impact on the pitch. It was still another soft goal though as no one closed their player down as he hit the ball which went in via the post. Phillips was subbed just after this although no one collectively was really playing well at that moment. He had Douglas in space on the left hand side of the pitch but ran across to the right instead and was caught in possession, but no one was helping him either. Peacock-Farrell made a great save to deny them a third goal prior to a good move from Leeds, when a great chance fell to Alioski but his shot was blasted over the bar. The second half struggled to get going because as always, when we have to play the officials as well, it never works out for us. The linesman missed a blatant shirt pulling in the penalty area too. With Birmingham players falling like flies and the ref blowing up all the time to slow the game down it took us until the 85th minute to pull a goal back when Alioski put the ball into the net in front of the Kop. There was a small celebration as he raced back to the half way line for them to get on with the game. It’s ironic how we didn’t need the trainer on the pitch after being fouled though, as our players got on with it! When eight minutes of injury time was put up it gave us a chance to get an equaliser and we nearly did get that, when Dallas’s shot was saved by their goalie to deny us a point. We did battle in the latter parts of the game to get back into it, but it was probably too little too late. After the game I headed to Green Hammerton with my other half for a charity evening to hear Ian playing from vinyl, his Motown and Soul music. Ian said I was at the beach playing football with his friend in Salonika in 1973 as we were on the same trip; it’s a small world really! On our way home, we encountered animals on the road as we ground to a halt just before the junction of the A58. All I could think of was the Leeds vile animals for some reason, oops. Despite losing for the first time this season (apart from the Carabao Cup), we have to pick ourselves us and get on with it. The defeat was always going to happen at some point sadly and for those calling for Peacock-Farrell to be dropped, the answer to that from me is no! We have to build our team around him and have to take the ups and downs that will happen along the way. I know fans are entitled to their opinion, but this team is being built for the future as well so we march on to our next game on Friday to Sheffield. I will be driving to this one with my daughter Dani straight from work. See you then – LUFC – Marching on Together!